Type "Peeple" into Google and you'll come up with a long list of news articles about a controversial people rating app. By unlucky coincidence, it’s also the name of the hardware start-up which won JLAB this week, John Lewis’ annual accelerator. The controversial Peeple caused outcry this week, with its ability to rate people as though they were restaurants or services. The JLAB-winning Peeple is an entirely different proposition, offering a smart spyhole that allows homeowners and tenants to keep track of who might be knocking on their door. CEO Chris Chuter, speaking to Marketing after the JLAB win, said the confusion had been a "huge issue" for the start-up. He said: "All I’ve been doing is cleaning up the records. The problem is that we did a decent job of branding. When you search for [Peeple], you do get a lot of our stuff. "The confusion has been very, very frustrating." Chuter wouldn't comment on whether his start-up was pursuing legal action, though this is unlikely. Both firms have applied to register their brands as trademarks in the US, but it's unlikely that JLAB's Peeple can force the Peeple app to change its name on that basis. Mark Owen, partner and IP specialist at Taylor Wessing, commented: "Sometimes you have to live with a level of confusion. It might mean your ads cost a bit more, but unless you've got a well-known mark, this is not something trademark can protect you from." Chuter is sanguine about the overall impact of the mix-up on his business. "The internet has a short-term memory," he said. "And it’s introduced us to people who wouldn’t otherwise know about us." As the JLAB winner, Peeple has netted £100,000 in funding from John Lewis and its smart spyhole will go on sale in the retailer from early 2016. Pricing isn’t available, though the device is available for pre-order through Peeple’s site. For a cost-intensive hardware start-up, John Lewis’ funding is negligible, but the retail opportunity is invaluable. It isn’t clear yet how long Peeple might be on sale on John Lewis, or whether it has to meet particular sales targets to stay on the shelves. Chuter said the start-up was due to meet John Lewis executives to hammer out an agreement later this week. For John Lewis, Peeple marks an expansion into the burgeoning internet of things. The retailer already sells Nest, the Google-owned connected thermostat, but wants to do more in the space. Peeple is a Wi-Fi camera, about the size of your palm, which can fit over a spyhole on a front door. It connects to a smartphone app and acts as a livestream, showing who may be at the door, or leaving and entering the house. Like Nest – and many other internet services – Peeple stores data using Amazon Web Services. 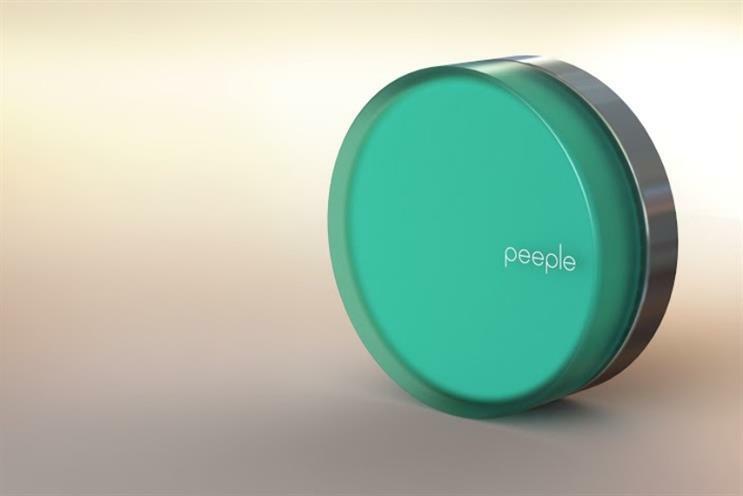 In its first iteration, Peeple is more like a CCTV system than a connected intercom. For example, it can’t tell a homeowner who is out and about that someone has just rung their doorbell. In future, the start-up will offer smart doorbells and motion detectors that can interact with the connected camera, but for now the company is focusing on the "bare basics". The first Peeple camera will arrive in John Lewis early next year, once production in China has commenced, Chuter said. While £100,000 is small change for John Lewis, putting Peeple on its shelves comes with some risk. Last year’s JLAB winner, Localz, was more of a behind-the-scenes service, using iBeacons to speed up click-and-collect in stores. Peeple actually entails putting a new product on the shelves in an unfamiliar category. Chuter acknowledged the risk, saying: "Our approach is to get a consumer foothold any way possible, and John Lewis is a big step towards that. "To sell a product like this, there’s a big area of education that needs to go on – we need help from a retailer like John Lewis." That means training staff up in explaining how to use Peeple, suggesting there will need to be further internal investment from John Lewis. Chuter added: "The British market will really embrace the smart home. Some of these devices do solve problem, and it’s not just about being geeky. "Once you have them, they change the way you behave in your house. We’re very optimistic."